The definition of cozy and stylish are encompassed in this light-weight layer of warmth for the coming seasons! Features a shawl collar, single button front closure, two front slit pockets. 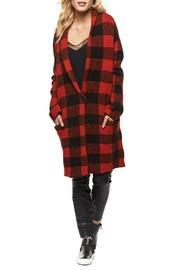 A sweater coat that has the perfect length. Pair it with a turtleneck and jeans or dress it up for work with an all black outfit!